At age 20, EMU’s Summer Peacebuilding Institute has directly inspired the creation of 12 other intensive peacebuilding training programs in Africa, Europe, the South Pacific, North America, and Northeast and Southeast Asia, all of which are explored in this issue of Peacebuilder. The training programs operate under the following entities, listed in chronological order of year officially founded. Bridge Builders– January, 1996 – headquartered in London, serving churches throughout the United Kingdom. JustaPaz – Fall of 1996 – headquartered in Maputo, Mozambique, mainly serving that country, yet also hosting participants from other Portuguese-speaking countries. West Africa Peacebuilding Institute (WAPI) under the West African Network for Peacebuilding (WANEP) – 1998 – headquartered in Accra, Ghana, with staff working in 15 countries: Benin, Burkina Faso, Cape Verde, Côte d’Ivoire, Ghana, Guinea, Guinea Bissau, Liberia, Mali, Niger, Nigeria, Senegal, Sierra Leone, The Gambia and Togo. Henry Martyn Institute’s (HMI) Peacebuilder Training Program – 1999-2000 – headquartered in Hyderabad, India, but serving all of India, with a special focus on ethnic minority regions in the far northeast of India. Africa Peacebuilding Institute (API) – 2000 – headquartered in Johannesburg, South Africa (originally in Kitwe, Zambia), serving the whole continent, but particularly southern and eastern Africa. Mindanao Peacebuilding Institute (MPI) – 2000 – headquartered in Davao, Philippines, attracting participants widely, but especially serving southeast Asia. The Peacebuilding and Development Institute at American University – summer of 2001 (closed after 2013 summer session by university administrators) – Washington D.C.
Just Peace Initiatives – 2005 – headquartered in Peshawar, Pakistan, serving all of Pakistan, with a particular focus on the northwest region where violent conflicts have a regional impact extending into Afghanistan. The Peace Academy in Sarajevo – 2007 – based in Sarajevo, Bosnia-Herzogovina (has not offered intensive trainings since 2012, but hopes are for resumption in 2016), serving post-Yugoslavia populations emerging from violent conflict. Pacific Centre for Peacebuilding – 2007 – headquartered in Suva, Fiji, but with wide focus on all South Pacific islands. Northeast Asia Regional Peacebuilding – 2008 – headquartered in Seoul, South Korea, but with summer peacebuilding sessions that rotate among South Korea, Japan, China and Mongolia. A sister group, the Korea Peacebuilding Institute, emerged in 2012. All 12 of the training centers have adopted materials and educational approaches that are reminiscent and evocative of SPI, the oldest peacebuilding institute of its kind – which makes sense, given the regular exchanges of instructors, who typically have long-standing connections to SPI’s umbrella institution, the Center for Justice and Peacebuilding (CJP). Of the 26 instructors teaching at SPI 2015, for example, 18 have taught at one of the other dozen peacebuilding centers listed above and 13 are alumni of CJP. Reflecting with pleasure on the emergence of SPI-inspired peacebuilding centers around the world since the 1990s, CJP founding director John Paul Lederach says that CJP and SPI can act as “incubators,” birthing ever-better peacebuilding theory and practices. While many of the other centers are working in situations where they must be highly sensitive to their immediate context and thus focused close to the ground, Lederach believes CJP can serve as a “place of safety” and as a “convener” of conversations necessary for cross-fertilization, learning and growth. CJP can also walk alongside those who are just starting out, he says, helping them to connect to the worldwide network of practitioners and to learn from their predecessors committed to building justice and peace. Tracing the proliferation of peacebuilding training centers around the world to their origins is a bit like trying to determine which spring, stream or river contributed which molecules of water to the bay of an ocean. The hunger for peace amid violent conflict, the desire to learn peacebuilding skills, and the efforts of peacemakers from every walk of life and tradition – these know no boundaries. They extend across all religions. Yet our focus in this Peacebuilder is necessarily narrow, mainly limited to how the Mennonite “peace church” tradition has given rise to practices and terminology that are transforming conflict around the world. That’s not to say that other traditions have not made major contributions, or that Mennonites have acted on their own (far from it, as you’ll see in these pages). But when the world seems bleak and hopelessness begs at one’s door, it helps to stop and reflect on how much has been accomplished by Mennonite initiatives in the last 20 years, relying mainly on dedicated people rather than other resources. 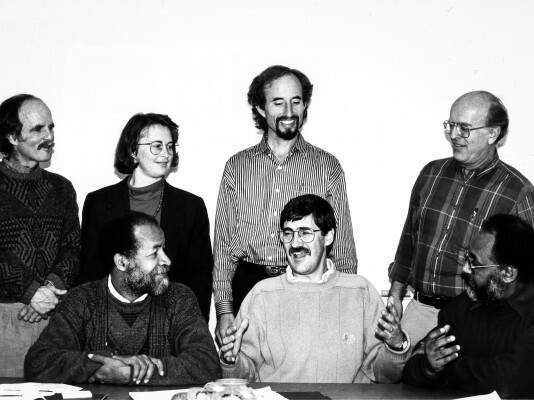 Seven who attended a strategic planning meeting in 1995 for EMU’s fledgling Conflict Transformation Program: (from left, standing) Paul Stucky, Ruth Zimmerman, Ron Kraybill, Vernon Jantzi. (Seated) Ricardo Esquivia, John Paul Lederach, Hizkias Assefa. Conciliation Service. In 1985, Kraybill organized the service’s first summer training institute for 20 Mennonite attendees. Kraybill’s first hand-outs on how to mediate were printed on cheap blue paper and distributed in a manila folder. By 1988, his handouts had gradually been enlarged into a spiral-bound manual, with additions from Lederach, David Brubaker (now a CJP faculty member), Jim Stutzman, Carolyn Schrock-Shenk and others. (Brubaker gets the credit for deciding that 40 pages of handouts would work better in a loose-leaf binder.) Contributors to the manuals were all leading trainings on their own, sometimes in conjunction with the Lombard Peace Mennonite Center near Chicago, which had been established by Richard Blackburn in 1984 to address congregational conflict. In the early 1990s, Kraybill and Lederach began talking about the need to systematically address conflict – particularly the need to prepare others for working in the field – rather than continue the Lone Ranger approach. Meanwhile at EMU, other field-experienced academics were having similar thoughts. Early in 1990, Joseph Lapp, then president of EMU, received a letter from Richard (“Rick”) Yoder, professor of business and economics. Yoder was on leave from EMU at the time and working in Kenya with the Kenya Rural Enterprise Program. I spent a couple days in rural Kenya with a U.S. congressional staffer from the House Foreign Affairs Committee and asked her questions as to how the U.S. is responding to all these, largely non-violent, political and economic changes in the Soviet Union and Eastern Europe. Her response was, ‘We really don’t know what to do; we don’t have the people or the tools to help us think in different paradigms!’ How sad, I thought; what do the Mennonites have to offer? In mid-1994, Kraybill and Lederach joined Hizkias Assefa, an Ethiopian scholar-peace practitioner based in Kenya, and Vernon Jantzi to teach conflict transformation skills to 40 participants at EMU’s “Frontiers of International Peacebuilding” workshop. The event was successful enough to be repeated in 1995, the same year that EMU admitted its first full class of master’s degree students in conflict transformation within a program directed by Lederach. Soon after, in 1996, CJP deepened its justice focus by recruiting to its faculty Howard Zehr, an expert in restorative justice. By 1996, the Frontiers workshop had evolved into a series of intensive classes under a name that has endured to this day – the Summer Peacebuilding Institute, or simply SPI. In those early years, the Frontiers in International Peacebuilding conferences and SPI were simply opportunities for professional development and learning. But participants and graduate students in CJP began lobbying for SPI to offer the option of taking a course for academic credit. Today, not-for-credit trainees and graduate students share classes at SPI, though the latter must do more out-of-classroom coursework to earn their credits. In 2014, SPI enrolled a total of 184 people from 36 countries. Over the years, SPI has attracted 2,800 people from 121 countries to EMU’s campus. Upon his departure to the University of Notre Dame in 1999, Lederach was followed as director by Jantzi, then jointly Howard Zehr and Ruth Zimmerman, then Lynn Roth, and now J. Daryl Byler – all of whom came with extensive international experience in conflict zones. 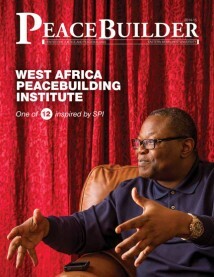 For a more thorough look at the history and functioning of SPI, see the summer 2014 Peacebuilder. One caveat to this list of 12: Reasonable definitional arguments could be made for taking a few off this list and adding a number of other initiatives around the world. For example, the Nairobi Peace Initiative-Africa (NPI-Africa) was founded in 1984 by Harold and Annetta Miller, both early ‘60s grads of EMU who were working with Mennonite Central Committee (MCC). NPI has an annual peacebuilding institute that has tapped CJP-trained alumni, such as John Katunga Murhula, MA ’05. The Great Lakes Peacebuilding Institute, founded in 2004 with seed money from MCC, serves Francophone peace practitioners with month-long trainings each October. Fidele Lumeya, MA ’00, and Krista Rigalo, MA ’00, have taught there, as has Mulanda Jimmy Juma, formerly MCC’s regional peace coordinator for southern Africa, who is teaching at SPI 2015. Other examples of cross-fertilization: (1) Kenyan Babu Ayindo, MA ’98, has taught at SPI repeatedly and at SPI-like peacebuilding initiatives in seven other locations. (2) Sriprakash Mayasandra, a native of India who is MCC’s Asia Peace Coordinator, attended SPI in 2011 and 2013. He served on HMI’s governing board from 2008 to 2014 and has been a guiding hand for other peacebuilding initiatives, notably MPI, NARPI, and the Caux Scholars Program, Asia Plateau. The Rick Yoder story was extracted from a history of CJP published in the 2005 inaugural issue of Peacebuilder, pages 3-7. All back articles and issues of Peacebuilder are accessible online at edu/peacebuilder/archives.